practices to help deter re-establishment. Creeping Charlie (Glechoma hederacea) is consistently a problem weed though some homeowners have come to tolerate it because it attracts and provides food for pollinators (one of its few redeeming qualities). 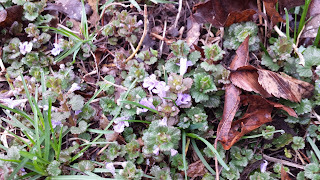 Also called ground ivy, creeping charlie is part of the Mint family. Like all mints, it spreads on top of the soil via stolons (surface roots) and will regrow from very small pieces of vegetation left behind in the soil after removal. It is a very adaptable plant and grows well in moist soil in part shade / full shade sites. Creeping charlie can be found where lawn grass is thin and not very robust. This may be in compacted soils, shady locations, and weedy sites. Therefore, treating with an appropriate product, maintaining a healthy lawn, utilizing shade tolerant grasses, and choosing alternative ground covers in areas not suitable for growing lawn grasses will help manage weeds including creeping charlie. Best cultural practices are recommended to encourage healthy growth and vigor of lawn grasses. Proper selection of grass varieties for the site, fertilization and watering practices that encourage deeply rooted plants are important to a healthy lawn that can out-compete weeds. Most lawns are comprised Kentucky bluegrass and perennial ryegrass and require full sun, proper nutrition, and non-compacted soils for optimal growth. A soil test can provide recommendations for soil health and fertilizer. As shade increases, it becomes less and less favorable for sustaining a lawn in this area, and more favorable for weeds like creeping Charlie. Pruning to increase sunlight and aeration may be options for improving growing conditions; however, if the area is too shady, give up on trying to grow grass in this area and consider planting other ground covers or a shade garden of perennial flowers. Timing of herbicide treatment is key to successful control of perennial weeds like creeping charlie. As always, read and follow all instructions and guidelines on the label of any product, synthetic or organic, including proper clean up and storage. Note that herbicides are only effective in managing weeds if applied properly. The herbicide label is the law and misuse constitutes illegal application. Autumn is the best time of year for systemic herbicide applications when creeping charlie is actively taking up nutrients from the soil to sustain the plant through the winter. Spring is a second option when the plant is actively growing. If you have a large area of creeping charlie or if your lawn is more than 50% creeping charlie, you may want to consider killing off the entire area with glyphosate (the active ingredient in the non-selective herbicide Round-Up®) and re-seeding. Note this product kills all plants including lawn grasses. Depending on the product formula, re-seeding can occur within a few days after application. People and pets may re-enter the area when dry. If you want to treat small areas where creeping charlie is growing in lawn grasses, you can use a a selective herbicide like 2,4-D, Dicamba or triclopyr, or combinations of these products. Triclopyr will be the most effective option for creeping Charlie. These are systemic, selective broadleaf herbicides. They are taken up by the plant and kill the entire plant from roots to flowers. Note they do not kill lawn grasses if applied properly. These products are effective and usually require only 2-3 applications per year depending on proper use and timing. In the past, borax (boron) was a product recommended for eradicating creeping charlie. However, research has shown that the addition of boron to soil, even in very small amounts, can create an unfavorable growing environment, and make it difficult to re-establish lawn grass. Also, this is an illegal application. Any product used in this fashion must be specifically labeled for the weed you are trying to control. Therefore, borax it is no longer recommended for eradication of creeping charlie. Round-Up® is a trademark of Monsanto Corporation. Living up against one of the Mississippi River bluffs, with my "yard"in the shade I have embarrassed Creeping Charlie and also the woodland violets. This can be mowed two to three times a year, and is sustainable versus massive use of herbicide. Are we not trying to grow beyond the perfect turf lawn?